Paul Nicholls is staying positive about Kauto Star’s recovery as the clock ticks down to next week’s Cheltenham Gold Cup. 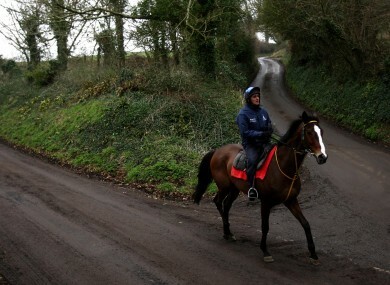 Kauto Star on the Ditcheat gallops (file photo). PAUL NICHOLLS IS gradually easing Kauto Star back to work in the hope of having him ready for next week’s Cheltenham Gold Cup. The dual Gold Cup winner is “heading in the right direction”, Nicholls said this morning, after a bad fall on the gallops last week threw his anticipated showdown with Long Run into doubt. Kauto drifted out to 4/1 with most bookmakers for fear that he might not make it to the starting tape next Friday, but Nicholls was positive after stepping up the 12-year-old’s recovery at his Ditcheat yard today. “Again, nothing major to report on the Kauto Star front this morning,” Nicholls wrote on his Betfair blog, “though we stepped up his work as we said we would. “He had his physio and an hour on the walker, as per usual. And then he had a 10f canter with Five Dream. But, in addition to that, he had a canter up the hill with the same horse. We will keep adding to this workload and tomorrow he will do the same, but have two canters up the hill instead of one. Again, he is fine and we are heading in the right direction at the moment. Clive Smith, the horse’s owner, said this morning that Saturday will be “D-Day” in terms of making a final decision on Kauto’s fitness. “If he has a setback any day it would not be good,” Smith said (AtTheRaces). Email “Nicholls: Kauto 'heading in the right direction'”. Feedback on “Nicholls: Kauto 'heading in the right direction'”.